I have been trying to develop something my self but its very hard due that I don't know java. I really would love to have fractals working as these applications i found on the net. With fractals there are many natural representations and fractals art to play with... there are many equations to chose from. Have a look at Julia and Mandelbrot in the Developer Examples folder. Java has not currently been incorporated into Quartz Composer as such, at least not that I've heard of. Doesn't mean it can't be done somehow, perhaps embedding .qtz into a Java applet would work, but otherwise would a plugin work? There's a ton of different fractals, and a ton of different ways of doing them in QC. There's actually a few in the examples folder if I remember right, look for Julia, Lorenz attractors, Mandelbrot. I think they're all in there. Colour banding on nested iterations of feedback is likely as not caused by one of two things. Other than that I'm not too sure, it does seem as though you are using a blur. If the Sprite[s] all on one level then it likely as not is produced by the intermixing of different sprites. Are you using a Render in Image? That can cause a lot of problems if not configured and populated cleanly at every level. Regarding Fractals and GLSL. The examples in the Developer folder are all GLSL. There are plenty of other GLSL examples out there, though most have to be adapted slightly to the GLSL used on OS X. Have a good browse around machinesdontcare for a lot of good examples of GLSL as executed within Quartz Composer. I have as yet to confirm this, but it would seem that in regards of being updated to the now widely adopted GLSL standard it is more blessed upon the Intel than upon the PPC. Not a gripe, just a fact. What works, works [ & what doesn't work - doesn't]. Beautiful looking Sprite patterns, even if you're getting an unexpected result along the line, by the way. Sorry, think I wasn't clear enough. The colour banding isn't part of the composition - it's related to the 'image writer' patch. There's no banding at all visible on screen, only in the saved image. I get that, and it is definitely from writing image (and not just with the image writer) AND using the gaussian. I will be surprised if you aren't using the gaussian. That's one of those things I've thought of and had irritated me many times, as I use that technique considerably, but I've never thought to bring up anywhere. Kudos for bringing that to light. 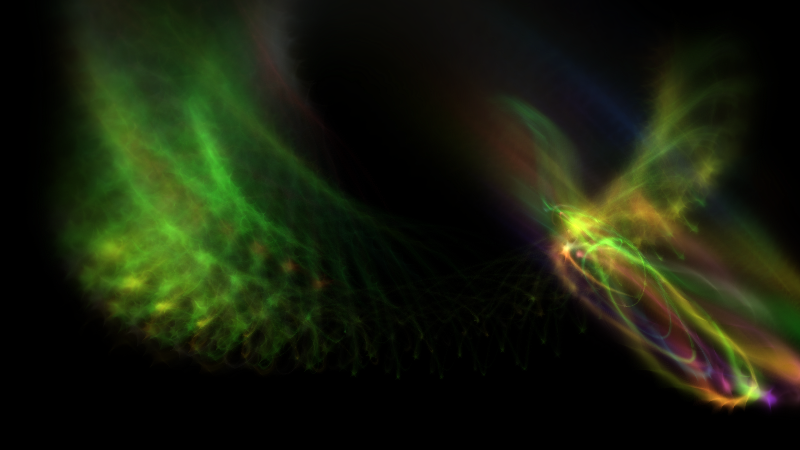 I agree with everything said about fractals PLUS, I will add that the GL Structure stuff is cool for messing with that. I'm not using the gauss filter at all there I think. All it does is draw sprites with additive blending, with a small amount of CI filter work to fade the background away nicely and colour cycle. The image writer doesn't even get the colour cycling filter at all.. In fact the image writer is simply connected to the output of a render-in-image which outputs plain 8-bit/channel images. Only thing I can think of which might cause it is if it's writing 256 colour pngs instead of 24bit? I'll have to dig into the code sometime. If you aren't using that, fuggedaboutit... what I'm saying doesn't apply.